Today is Day 4 of my two week vegetarian lifestyle. So far it’s been a breeze, I hope this trend continues. 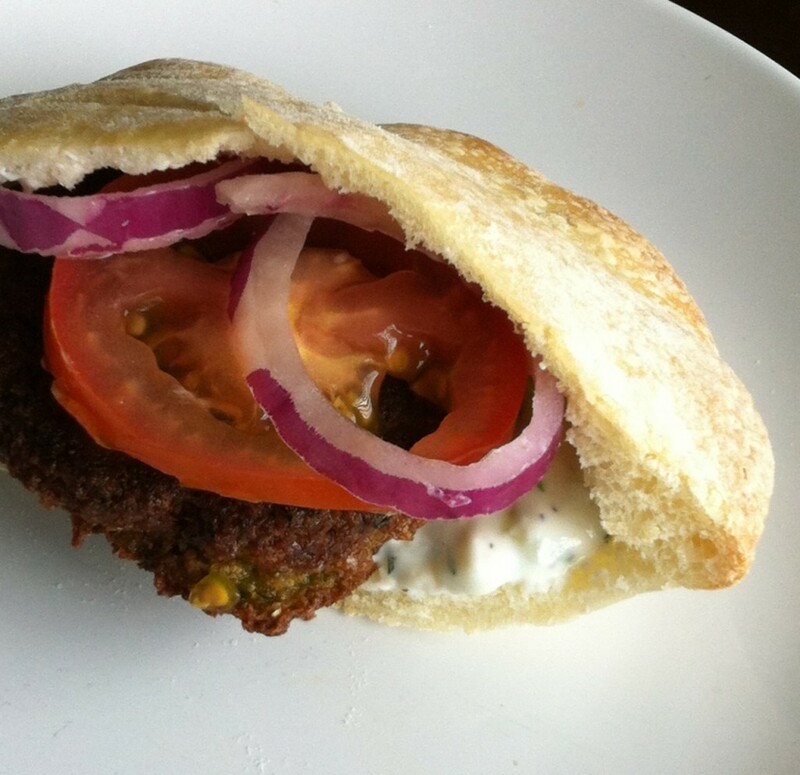 I started off with a bang on Saturday by making Falafel which was out of this world. I served it in a pita with a cucumber dill sauce and vegetables. This passed the man test because the Mr. gobbled it up. For lunch on Sunday I made tricolor pasta in a red pepper sauce with lots of mushrooms, peas, string beans and Parmesan cheese; another winner! 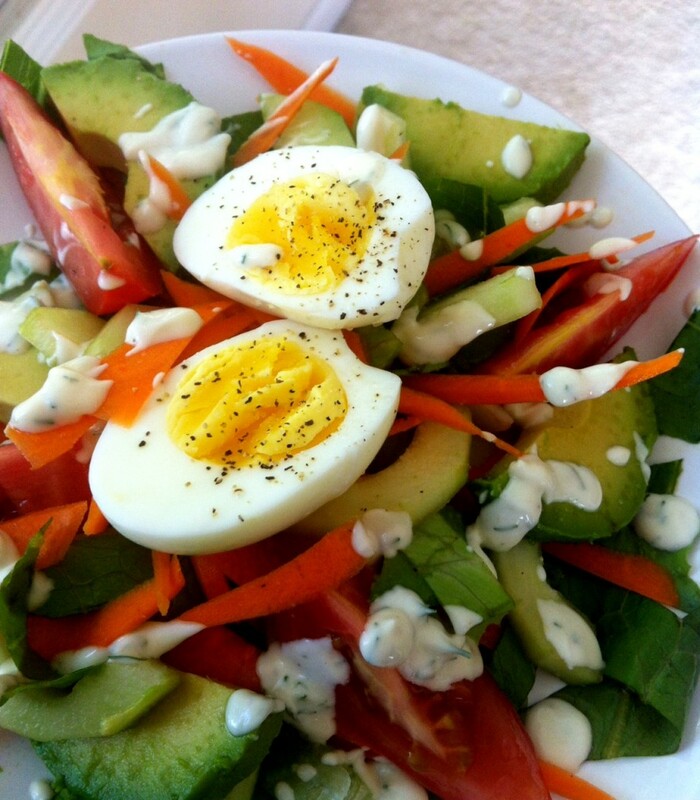 Later that night I had a salad topped with a hard boiled egg then drizzled with a yogurt dill sauce which was simply amazing, I could get used to this. While my all veggie diet is going better than expected, I must say I’m conflicted as to whether to add fish to my diet. There’s a part of me that expects a bout of madness to hit me halfway through my journey and I suspect that fish will be my savior. The other side of me is afraid that the consumption of fish will be the gateway to my meat cravings. I say go hard or go home. Two week is not that long, so I can do this…I must do this! 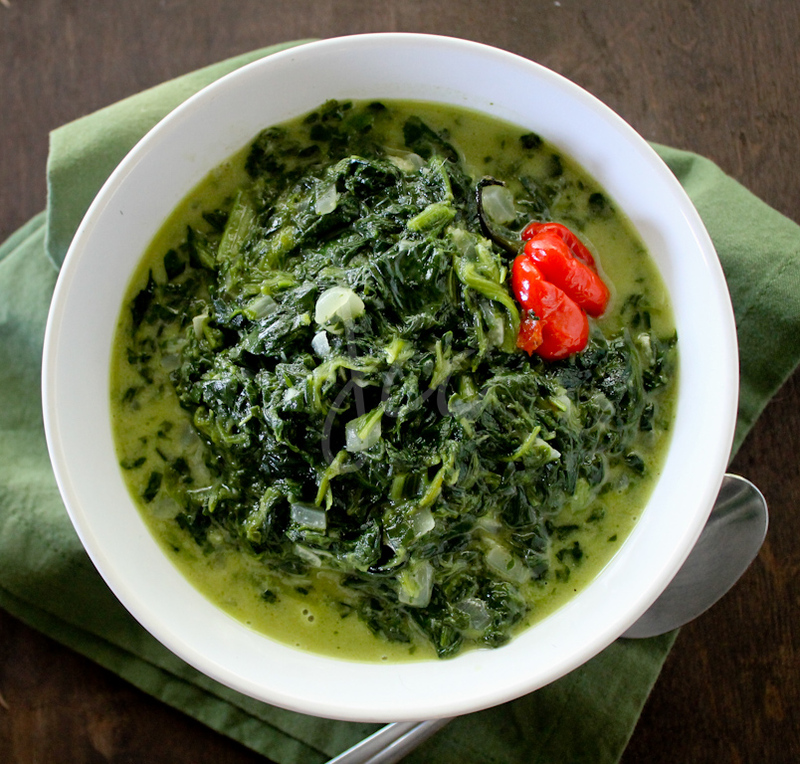 Next up on the veggie roster is Spinach cooked in Coconut Milk; I like to call this the Caribbean version of Creamed Spinach. If I was living somewhere close to the Equator I would use callaloo, but since necessity is the mother of invention, spinach is a great substitute. 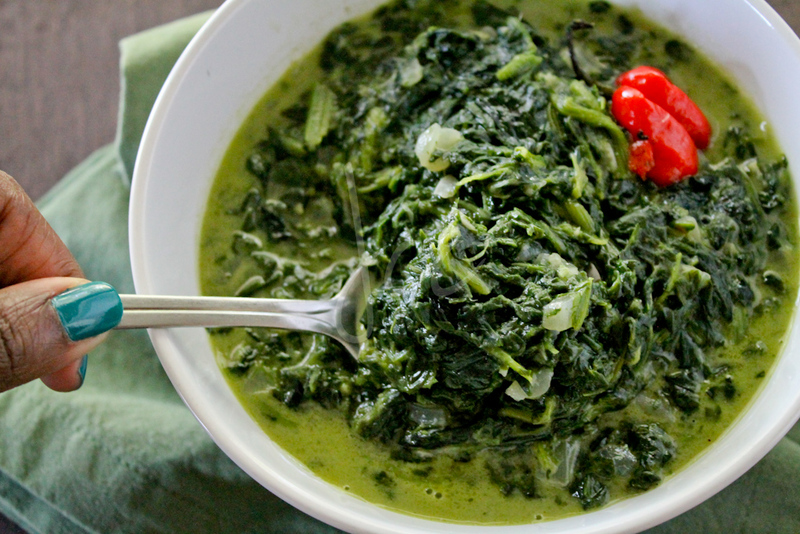 Fresh callaloo, a leafy plant found throughout the Caribbean and Guyana, is difficult to find in the US. I’ve seen the canned version in Caribbean grocery stores but when it comes to my vegetables, my first preference is fresh and if that’s not available I will use frozen. With that being said, I use frozen spinach in this dish because it’s what I had on hand at the time, feel free to use fresh spinach. This dish combines the sweet and spicy which perfectly complements the slight bitterness of Spinach. Serve this with roti and curry for a sensational combination. Over a medium fire, place canola oil in a large sauce pot. When oil is hot, add onion and cook until soft. Next add ginger and garlic, cook for 30 seconds or until fragrant. Add spinach, stir fry for 2 minutes then add coconut milk, allspice, scotch bonnet pepper, salt and sugar. Bring to a boil then lower the heat, cover and simmer for 15 minutes. Remove from heat, serve warm. Good luck to you! We toured a Buddhist Temple yesterday on a field trip. After listening to the discussion about begin vegetarian, I felt so conflicted about the fact that we casually eat meat, fish, eggs, etc. without giving it too much thought. I admire your thinking deeper about this issue and making a foray into the purely vegetarian world. We don’t eat too much meat but I know we would eat a lot more vegetables. I might just try this… without the Scotch Bonnet of course!!!!! This sounds delicious even though I have never been a fan of cooked greens. It’s not something we grow up with here in Puerto Rico. Looks good. You could always try a meat alternative to satisfy you if a crazy craving hits. In your instructions, you refer to ginger; however, I don’t see the amount in the recipe. Hi Jan . Its 1/2 tsp crushed ginger .